7 to 7.99 square inch custom die cut magnets 20 MIL are unique promotional items that will bring great exposure and advantage to your campaign. You can customize these promotional die cut magnets 7 to 7.99 to resemble your new product or business symbol or logo or any associated graphics. Our guaranteed low prices coupled with complimentary full color printing, artwork assistance, digital design proofs and shipping will keep your campaign sailing for long. 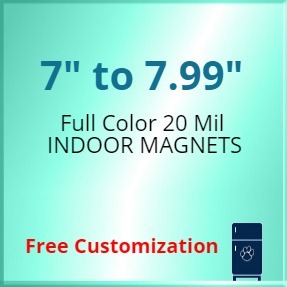 Order any of our logo printed magnets today at extremely low price! Request a quote to know price cuts that you can avail for wholesale 7 to 7.99 square inch promotional die cut magnets 20 MIL. Product Weight: 8 lbs per 500-approx.